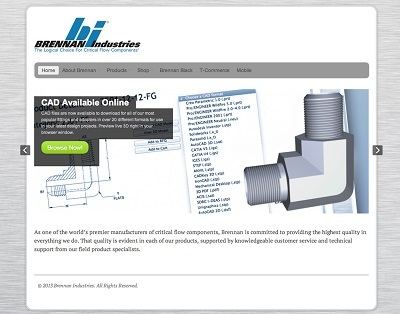 CLEVELAND  Brennan Industries, Inc., a leading international supplier of hydraulic fittings and adapters, has launched a new website at www.Brennaninc.com with its online parts catalog, configurator and a free CAD download solution. The user-friendly website allows designers to conduct a search of available parts, view the parts in 3-D, and then download the CAD model that can be included directly in customers design or specification documents. More than 8,000 individual hydraulic fittings and adapters are available in 3-D CAD models. Designers can select two types of CAD models (with or without threads) that supply lightweight or heavyweight models, depending on the users needs.